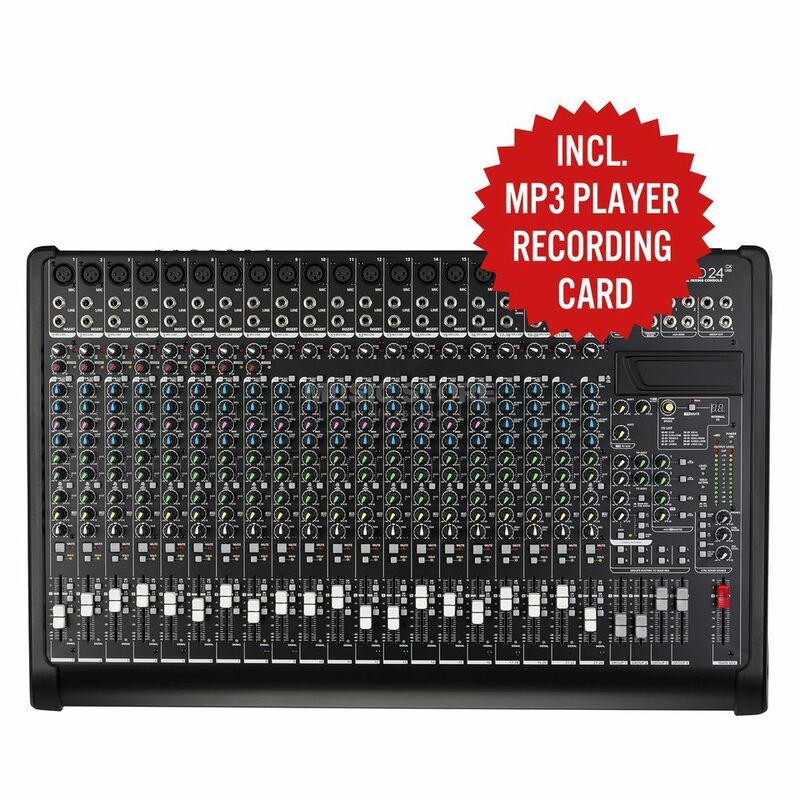 The RCF L-PAD 24CX USB Mixing Desk is a 24-Channel Mixer, with 18 Mono & 4 Stereo Inputs, and 8 On-Board Compressors. With eighteen transparent sound mic inputs, four stereo line inputs and the 2tk in/out, L-PAD 24CX is the ideal tool for gigs, complex conferences, corporate events and all situations where it is necessary to handle several signals. Four single-control compressors on mic channels help to handle even the more dynamic complex signals. Two Auxiliaries sends allows control of a small stage with the appropriate wedge monitors. The super versatile L-PAD slot permits the optional cards L-PAD MP3 PLAYER, PLAYER/RECORDER or BLUETOOTH CONNECTION cards to be inserted for even more flexible use. Thanks to the accurate Italian design L-PAD 24CX is easy to grab, transport and handle in all live event situations. The L-PAD mixer series is characterized by its compact, powerful, and flexible Mixers. The Italian design visual accents, which make the L-PADs always look good both at concerts, conferences, museums and other applications. All models have an excellent audio quality. Microphone channels are fitted with an easy-to-use one-button compressor that controls the parameter Attack and Threshold simultaneously. The L-PAD 24CX USB features a complete master/monitor section allowing easily control of 4 STEREO RETURN input with related AUX sends, 2 PHONES output, Internal FX to AUX sends, CONTROL ROOM, 2TK input, 4 GROUPS out freely assignable to MAIN MIX. From the L-PAD 8C the consoles with one of three plug-in cards can expand, allowing the optional wireless audio transmission via Bluetooth or playback / recording of one or a standard USB stick. The L-PAD 24CX USB has a USB port on its back panel for driverless connection to any computer where it will be automatically recognised as an audio device. You can then record a 2trk signal from the mixer, main mix or GR1-2 depending on back panel selection.